At least 200 people congregated in Waitangi Park, Wellington, and marched on Friday the 11th of May, 2012, as part of the second annual Queer the Night march against homophobia and transphobia. “In 2011, after a series of queer bashings in Wellington, hundreds of people from the community came together to reclaim the streets, to paint the town pink & purple, to Queer the Night. Out of this march the Queer Avengers formed. This is the annual Queer the Night march. This time we’re particularly supporting Pink Shirt Day on the 18thof May, and more generally opposing all homophobia and transphobia. After a loud and energetic march through downtown, resplendent with placards and banners as well as glitter, rainbows and sparkles, we congregated in Cuba Mall for a short series of speakers. A student spoke of her experience leading a QSA in her school – “A year ago I attended the first Queer the Night and at the time I felt so alone and isolated. So much has happened to change that in the last year”, “we know there’s a problem [in our schools] – We don’t need stats”. Speaking about the role of QSAs in creating safe spaces, she said “We shouldn’t need safe spaces – our schools and communities should be doing their damned job!” This was reinforced by a transgender student who spoke of the 7 schools he had been through in 3 years, the friends he had lost to suicide due to constant bullying and harassment at school, and of being kicked out of his own home when he came out as considering himself male. Recently, Wellington news media was all over the story of two women who claimed they were ejected from a public bar for being publicly affectionate. Whatever really happened in that particular case, the reality is that every day queer people are turned away from bars and other public venues and face harassment for expressing their sexuality or gender. In our schools this takes on a different tone in the form of personal bullying, but it is no less exclusionary. In workplaces and public services, lower wages, exclusion from work and denial of services based solely on ones gender or sexuality is common. Bashings and assaults of queer and transgendered people are so common place as to scarcely ever make news. Tragically, murders in the Wellington region have made the new these last years too. In the workplace, the streets or in our schools, discrimination kills. The struggle to end queer oppression and discrimination needs to be part of a wider struggle to end oppression in all fields of life. “An injury to one is an injury to all”, as the Wobblies said, and it is for this reason that any struggle to create a better world must, by definition, include the struggle for queer rights and to end discrimination based on sexuality or gender. 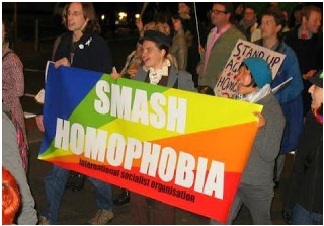 The International Socialist Organisation is proud to have been out in support of Queer the Night in Wellington. It doesn’t get better until we make it better!